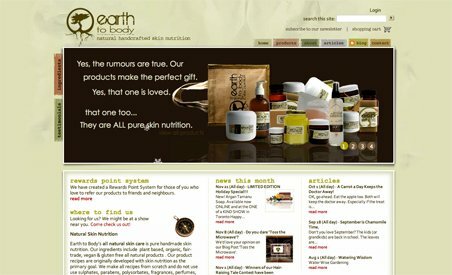 Earth to Body is a line of all natural skin care based out of Montreal, Quebec. Their products are organic, plant-based, vegan and gluten free. All of the recipes are made from scratch, and are produced in small batches so consumers always receive the freshest products possible. Earth to Body skin care products are developed with skin nutrition in mind. Their website promotes a green lifestyle by offering online shopping, as well as informative articles and a blog.